Tomasello, Michael. 2014. A Natural History of Human Thinking. Cambridge, MA: Harvard University Press. 178 pages. Influential circles in German philosophy have taken an American anthropologist into their hearts. A comparative psychologist and linguist by training, Michael Tomasello has served as co-director of the Max Planck Institute for Evolutionary Anthropology in Leipzig since it was founded in 1997. Two special issues of Deutsche Zeitschrift für Philosophie, arguably the most important German-language philosophy journal, were dedicated to his previous books, The Cultural Origins of Cognition (1999) and Origins of Human Communication (2008) . Tomasello was awarded the Hegel Prize in 2009. In his laudatory speech, Jürgen Habermas “raised” the laboratory researcher to the rank of a “true philosopher” . And indeed Tomasello’s oeuvre, including his new book, A Natural History of Human Thinking, provides fresh answers to a set of philosophical questions that laid the foundations for anthropology in the 18th century: What is “Man”? How do human beings differ from the animals? What are the origins of human sociality? How has society evolved from this state of nature to its modern forms? Having grown up in the American South in the 1950s and ’60s, which he experienced as an apartheid system, Tomasello knows firsthand how what he judges to be a human disposition to direct aggression against other groups can corrode the social integration of multiethnic societies. In the face of an increasingly globalized world inhabited by a fast-growing human population of unprecedented size, the anthropological concern with human sociality is currently rearticulated in a form very different from the 18th century. Tomasello wonders whether our evolved capacities for cooperation in small groups scale up successfully to large-scale modern civilization: “We are still here. But of course we are only a few nuclear bombs or a few more decades of rampant environmental degradation away from not being here.” Considering the almost apocalyptic zeitgeist of the Anthropocene, which foresees the disappearance of humanity at the very moment of its greatest expansion, Tomasello’s Natural History of Human Thinking spins a surprisingly optimistic narrative. Human nature was once the epistemic object of anthropology. The notion of nature in “human nature” did not refer to the phenomena of the physical world, but to the often non-physical characteristic features of humans such as mind, reason, history or culture, distinguishing them from other living beings. Because of this essentialist connotation, contemporary anthropologists hardly ever speak of human nature anymore. In the face of cultural diversity and due to a pronounced normative commitment to the recognition of difference, most cultural anthropologists have given up looking for universals shared across all cultures, from which human nature could be distilled. At the same time, the Darwinian emphasis on biological variation even within species, a growing fossil record constantly multiplying transitional forms between modern humans and apes, and field observations of animal behaviors once thought to be uniquely human have led many evolutionary anthropologists to emphasize continuity rather than difference between humans and other species. Although the term “human nature” has been erased from Tomasello’s vocabulary as well, he continues to be passionately interested in the differentia specifica that sets humankind apart. 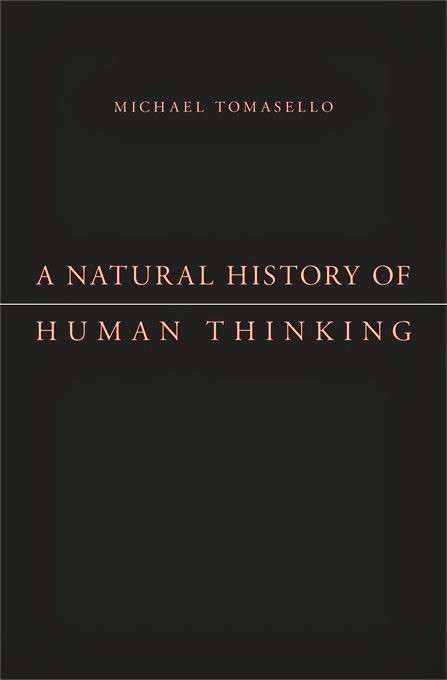 A Natural History of Human Thinking is a sequel to Tomasello’s The Cultural Origins of Human Cognition (1999), in which he maintained that it was culture that made humans unique. The underlying ability to acquire knowledge and skills from others and to build on the achievements of preceding generations without constantly having to reinvent the wheel has led to a growing complexity of human cultures. Tomasello claimed that this “ratchet effect” and the ensuing process of cumulative cultural evolution distinguished humans from the great apes, whose cognitive limitations kept their life forms static. Unlike navigating an unknown city with Google Maps on an iPhone or flying an Airbus across the Atlantic, the most complex forms of tool use observed in chimpanzees — the cracking of nuts with a stone hammer and a mobile anvil stabilized by a wedge in Bossou, Guinea, or the combination of up to five tools to extract honey from underground beehives in Loango, Gabon  — could, at least in theory, have been invented within one generation. At a time when cultural anthropologists had discarded the idea that any contemporary human group could represent man in the state of nature, nonhuman primates became the new “people without history.” Susan Sperling once noted that substituting primates for “primitives” retained an important Western cosmological category in the era of decolonization . Homo sapiens, by contrast, appears in the story of Cultural Origins as the agent of a newly emerging cultural history, subject and object of an almost Hegelian ascent toward more and more complex forms of knowledge and technology. Tomasello’s new book, too, looks for anthropological difference in the human capacity for culture. But its focus has shifted from the diachronic aspects of cultural transmission toward the synchronic aspects of social coordination and collaboration. From this angle, culture appears to have emerged as humans acquired the ability to put their heads together with others, solving problems, conventionalizing languages, producing norms and building institutions. Thereby, group cohesion was rendered possible on a bigger and more complex scale. The central claim advanced by A Natural History of Human Thinking is the so-called shared intentionality hypothesis: Modern humans came into being as their ape-like ancestors moved from individual to increasingly cooperative problem solving, from predominantly competitive relations with others, which Tomasello still sees in chimpanzees, to collaborative foraging with a partner and eventually the larger and more permanent shared life of a cultural group. Cognitively, this required a transition from individual to joint and shared intentionality, that is, the ability to share attention on a third object and to coordinate individual perspectives on this object. Without such cognitive synchronization, it would not have been possible to adopt different roles and divide labor in the pursuit of a common goal. Tomasello argues that it was this “cooperative turn” that enabled a social evolution from hunter-gatherer bands no bigger than chimpanzee groups to tribal societies and modern nation-states. The book does not address any of the societal implications of its narrative. But the Hegel Prize lecture makes clear that Tomasello draws political hope from this natural history. While evolutionary psychologists have worried that our modern skulls house a stone-age mind, which has not evolved to cope with the exigencies of a globalized industrial world that is home to more than seven billion people, Tomasello’s antireductionist account of cultural inheritance and social coordination suggests that Homo sapiens has acquired mechanisms of behavioral adaptation many orders of magnitude faster than organic evolution. This makes him optimistic that the very capacities that have led to the challenges humans are now facing also enable the political practices and institutions that might help to overcome these problems: “New prosocial norms for being careful with our environment and for recognizing the dignity and value of all peoples from all ethnic groups seem to be spreading in influence, not receding, and we are continually finding new ways for creating more cooperative and open arrangements for communication and coalition-building in large-scale societies, as Professor Habermas has argued” . Empirically, A Natural History of Human Thinking is largely based on experiments conducted in Tomasello’s laboratory. Over the years, his research group developed an approach that breaks up anthropological difference by tracing it back to seemingly small cognitive dissimilarities between humans and apes. Culture and language form only the capstone, not the foundation, of uniquely human thought. As mentioned earlier, for Tomasello, joint intentionality and joint action constitute the key human traits. Among comparative psychologists, however, this claim is highly contested; other studies of joint attention have found continuity rather than discontinuity between human and nonhuman animals such as chimpanzees, dogs, horses and dolphins. However, the pinpoint accuracy with which Tomasello defines the nature of human cognition motivated his recruitment as a scientific ally by contemporary proponents of philosophical anthropology. As Habermas correctly pointed out, Tomasello’s work aspires to provide empirical answers to philosophical questions. In his Hegel Prize lecture, for example, Tomasello claimed to have resolved a controversy over human nature that has haunted anthropology since its inception. “Rousseau, not Hobbes, was right,” he stated, “humans are born helpful.” In fact, Rousseau believed that when human beings began to help each other, they destroyed the state of nature and initiated a socializing process that would gradually erode their freedom and equality. However, the experiments conducted in Tomasello’s laboratory are not conducted on Rousseau’s “savage man,” but on contemporary children and chimpanzees. Their cognitive capacities provide Tomasello with a factual basis to speculate about the minds of early humans. Tomasello interprets his experiments as revealing that chimpanzee cognition is bound to be competitive, while human infants engage in collaboration independent of cultural conventions or language. Similarly, his systematic comparison of great apes and foragers concludes that, while apes behave individualistically, humans cooperate with each other, from collective child care and communication for the sole purpose of helping others to active teaching and group decision making. This last term refers back to the pre-Darwinian conception of a great chain of being that connects the “lower” animals to creatures of greater complexity and perfection — a logic that still informs the advancement from chimpanzees to foragers to modern humans in Tomasello’s evolutionary model. Tomasello is well aware of the breaking points in his account. He admits that “we do not know how much contemporary great apes have changed from their common ancestor with humans because there are basically no relevant fossils from this era”; that “contemporary human foragers are not good models for the early humans we are imagining here, as they have gone through both steps of our evolutionary story and so live in cultures with social norms, institutions, and languages”; that “preschool children are not good models for the early humans we are picturing here because they are modern humans and they are bathed in culture and language from the beginning”; and that “it is not even clear that Homo heidelbergensis was a separate species at all.” It is also striking that Tomasello’s natural history is almost free of historical dates. His timeline has the last ancestor living six million years ago, with Homo heidelbergensis setting the evolutionary path to modern humans about 400,000 years ago. In 1986, sociologist of science Bruno Latour and primatologist Shirley Strum compared a broad range of accounts about the nature and origins of human sociality, from Hobbes and Rousseau to Richard Dawkins and E.O. Wilson. They concluded that the stories of the Enlightenment philosophers were almost devoid of facts but continued to be the most coherent despite the subsequent accumulation of empirical knowledge. Narratives that integrated more facts, on the other hand, seemed to pay less attention to the coherence of the framework within which the facts had been placed . Tomasello’s origin account is as coherent as Rousseau’s speculations and as rich in empirical findings as the sociobiological works examined by Latour and Strum. But considering how fragile the representational relations between his live test subjects and the extinct protagonists of his story are, it seems as if his laboratory’s research on comparative psychology might not have translated well into natural history. Tomasello’s carving of nature at its evolutionary joints has created a conceptually clear-cut and therefore philosophically appealing narrative structure, but it comes at the high price of historical vacuity. A Natural History of Human Thinking not only carries the 18th-century discourse of philosophical anthropology into the new millennium, it can also be read as a conservative intervention into the much more recent controversy over nonhuman cultures. Since the 1990s, proponents of the idea that cultural learning and diversity do not distinguish Homo sapiens, but can also be found in other species, especially the great apes, have institutionalized the field of cultural primatology. While self-identified chimpanzee ethnographers such as William McGrew and Christophe Boesch have emphasized evolutionary continuity, Tomasello has been one of the most prominent defenders of culture as a hallmark of human singularity. Epistemologically, this debate has taken cultural primatology through many of the motions that cultural anthropology has gone through before. In the face of both human and chimpanzee cultural diversity, Boesch challenged Tomasello’s cross-species comparisons on the ground that neither do German toddlers represent all of humanity nor can the captive chimpanzees of the Leipzig zoo stand in for “the” chimpanzee . Just as critics of hunter-gatherer studies argued that the life ways of the San were not at all pristine but the product of interactions with local agriculturalists and European colonizers, a current article on apes in the Anthropocene urges primatologists to consider the impact of human activities on their supposedly re- mote study populations . Together with the social anthropologist Jeremy MacClancy, primatologist Agustín Fuentes has called for a critical scrutiny of fieldwork practices in biological anthropology modeled on the forms of reflexivity developed in 1980s cultural anthropology . But the reflexive ethnography resulting from this period was not only concerned with ethnography qua fieldwork but also with ethnography as a way of writing culture. One of the most influential critiques of ethnographic forms of representation was Johannes Fabian’s Time and the Other, which questioned how social evolutionist accounts had denied the coevalness of non-Western cultures by removing them to another age. Whereas Darwin’s transition from the Great Chain of Being to the Tree of Life had emptied time of its directedness, social evolutionism maintained a narrative of progress, from primitive cultures to modern civilization. In sociocultural anthropology, such teleological narratives eventually came to be rejected for both political and epistemological reasons. Two recent articles in Annual Review of Anthropology arguing for and against the use of living great apes as models of early hominids reveal that evolutionary anthropology is currently reassessing its own epistemological presuppositions, though not its political ones. Craig Stanford defends model making in evolutionary anthropology by pointing out that all theories about the human past relied implicitly on modern primates as basic reference points . On the other hand, Ken Sayers et al. emphasize these animals’ contemporaneity and ask why chimpanzees, bonobos, or gorillas should serve as models for organisms separated from them by eight million years or more of evolutionary change . Of course, no model must ever be mistaken for that which it models — politically motivated critiques of hunter-gatherer studies have overlooked this point all too often. Tomasello identifies neither chimpanzees with the last common ancestor nor children or modern hunter-gatherers with early humans. Yet it is precisely this gap between representandum and representatum that lapses his natural history into a crisis of representation — at least that is how, in the 1980s, cultural anthropologists had come to refer to their growing awareness of the inevitable social construction of their accounts. However, the popularity of Tomasello’s work among German philosophers should serve as a reminder that his Natural History of Human Thinking not only is socially constructed, it also helps construct society. The question of what kind of society that could be is one readers of Anthropology Now might ask as they peruse this provocative book. 1. Deutsche Zeitschrift für Philosophie 55, no. 5, and 59, no. 1. 2. Jürgen Habermas, “Bohrungen an der Quelle des objektiven Geistes: Hegel-Preis für Michael Tomasello,” in Im Sog der Technokratie: Kleine Politische Schriften XII, Originalausgabe (Frankfurt/M. : Suhrkamp, 2013), 173. 3. Michael Tomasello, “Rede, gehalten anlässlich der Verleihung des Hegel-Preises 2009 [English]” (Stuttgart, 2009), 1, http://www.stutt- gart.de/img/mdb/item/383875/51641.pdf. 4. Christophe Boesch, Josephine Head and Martha M. Robbins, “Complex Tool Sets for Honey Extraction among Chimpanzees in Loango National Park, Gabon,” Journal of Human Evolution 56, no. 6 (2009): 560–569; Tetsuro Matsuzawa, “Field Experiments on Use of Stone Tools by Chimpanzees in the Wild,” in Chimpanzee Cultures, ed. Richard Wrangham et al. (Cambridge, MA: Harvard University Press, 1994), 351–370. 5. Susan Sperling, “Baboons with Briefcases vs. Langurs in Lipstick: Feminism and Functionalism in Primate Studies,” in Gender at the Crossroads of Knowledge: Feminist Anthropology in the Postmodern Era, ed. Micaela Di Leonardo (Berkeley: University of California Press, 1991), 209. 7. Bruno Latour and Shirley C. Strum, “Human Social Origins: Oh Please, Tell Us Another Story,” Journal of Social and Biological Structures 9, no. 2 (1986): 185. 8. Christophe Boesch, “What Makes Us Human (Homo Sapiens)? The Challenge of Cognitive Cross-Species Comparison,” Journal of Comparative Psychology 121, no. 3 (2007): 227–240. 9. Kimberley J. Hockings et al., “Apes in the Anthropocene: Flexibility and Survival,” Trends in Ecology & Evolution 30, no. 4 (April 2015): 215–222. 10. Jeremy MacClancy and Agustín Fuentes, “Centralizing Fieldwork,” in Centralizing Fieldwork: Critical Perspectives from Primatology, Biological, and Social Anthropology, ed. Jeremy Mac- Clancy and Agustín Fuentes (New York: Berghahn Books, 2010), 1–26. 11. Craig B. Stanford, “Chimpanzees and the Behavior of Ardipithecus ramidus,” Annual Review of Anthropology 41, no. 1 (2012): 146. 12. Ken Sayers, Mary Ann Raghanti, and C. Owen Lovejoy, “Human Evolution and the Chim- panzee Referential Doctrine,” Annual Review of Anthropology 41, no. 1 (2012): 131. Fabian, Johannes. Time and the Other: How Anthropology Makes Its Object (New York: Columbia University Press, 1983). Tomasello, Michael. The Cultural Origins of Cognition (Cambridge, MA: Harvard University Press, 1999). ———. Origins of Human Communication (Cambridge, MA: MIT Press, 2008). ———. Why We Cooperate (Cambridge, MA: MIT Press, 2009). Stephanie Schiavenato is a doctoral student in anthropology at New York University. She studies the ethics of mourning in postmortem practices following pregnancy and infant loss. She also works as a labor doula in New York City. Esther Rottenburg is an MA candidate in Global Health at the Vrije Universiteit Amsterdam, the Netherlands. In spring 2015 she was a visiting student at the New School for Social Research. Her main interest lies in sociopsychological aspects of health. She currently studies patients’ perception of their role in chronic care in Vietnam. Nicolas Langlitz is associate professor of anthropology at The New School for Social Research in New York. Author of Neuropsychedelia: The Revival of Hallucinogen Research since the Decade of the Brain (2013), he currently studies the epistemic culture of neurophilosophy as well as the intersection between primatology and the human sciences in chimpanzee ethnography. This entry was posted in Selected Print and tagged book review, evolution, philosophy. This website is copyright © 2016 Anthropology Now. Background image courtesy of Daniel Byers.